Following a very successful collaboration between two ladies from Norwich and two from south of the border that resulted in some beautiful 1950s style boudoir images featuring vintage nightwear from me, (Susie Pritchard of Wake Up Little Susie) being worn by Suffolk model Jody Sturman sporting classic Hollywood Waves & ‘50s style make-up by Norwich based Jessica Ludlow of Rock ‘n’ Rolla Hairstylist, with another Suffolk girl Caroline Lawrence behind the lens, we decided immediately to team up together again for another themed photo shoot. 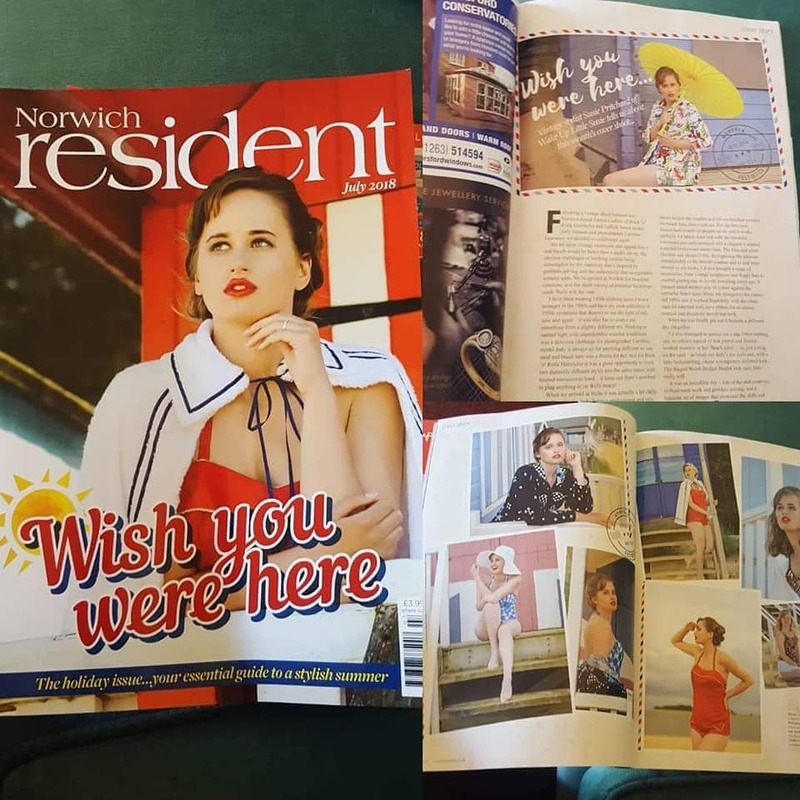 We hit upon vintage swimwear, and agreed that a genuine local location would be better than a studio set up – the obvious challenges of working outside being outweighed by the creativity that’s inspired by problem solving and the authenticity that recognisable scenery adds to the images. We’re spoiled in Norfolk for beautiful coastlines, and the sheer variety of potential backdrops made Wells-Next-The-Sea win the vote. Onto the day itself – it’s always tricky to pin down a date that finds all the team members available, and when shooting outside there is of course the added consideration of the weather forecast. We tackled this with a ‘let’s just go for it’ attitude, so the day came and we found ourselves at the home of our hairstylist with Jody’s first style being worked on by Jessica whilst Caroline took behind the scenes images, and we all anxiously checked our phones to see what the weather was going to bring…With the first ‘look’ completed we headed off to Wells in Caroline’s car; you know when you’re driving along in the rain and you manage to convince yourselves that it looks brighter on the horizon? Well, it was one of those kind of days! Once we’d arrived & got out of the car, it turned out it was actually a bit chilly at the seaside as well as drizzly…Never mind, by this time we were all hungry so it made sense to head to the nearest chip shop for lunch, and of course by that time the sun would surely be out…We had a fabulous meal on the harbour and all were in agreement that even if we had to abort at this stage, nothing was lost as four good friends had enjoyed a lovely drive and meal out together. Jody being a professional and very excited about the concept of this shoot agreed to go ahead despite the weather, and off we trundled towards the beach huts, dunes and sea. 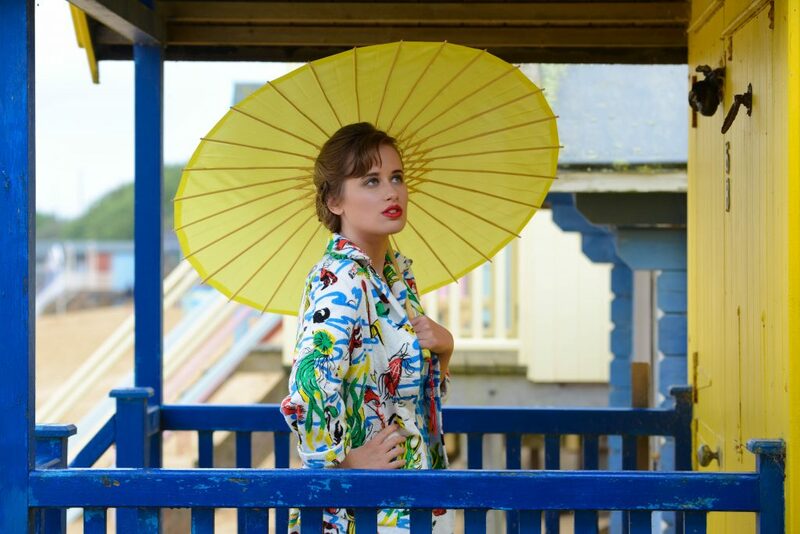 We started working by the beach huts, to afford us some shelter as it was still raining and because of the beautiful shapes and colours for Caroline to work with, and which also influenced some of the outfit ideas. As always, we had planned outfits beforehand but again as always, as the day evolves, ideas and plans change too which is all part of the creative fun. For the first look, Jessica had created an elegant ‘up-do’ which works perfectly for beach wear and with the beautiful traditional pin-curls arranged into a chignon it created a perfect 1950s Hollywood starlet look to complement the 1950s outfits. The blue and white checked suit shouts ‘50s all over, with a fun, teenage look too. ….and when we changed to the classic red 1950s suit (make-shift changing area behind the beach huts of course!) it worked beautifully with the white cape-let trimmed with navy ribbon for an almost nautical and decidedly movie star look. It is worthy of note that behind the scenes, the rest of us were sheltering under the awnings of locked up huts and wearing the hats and cover-ups to protect us from the drizzle! 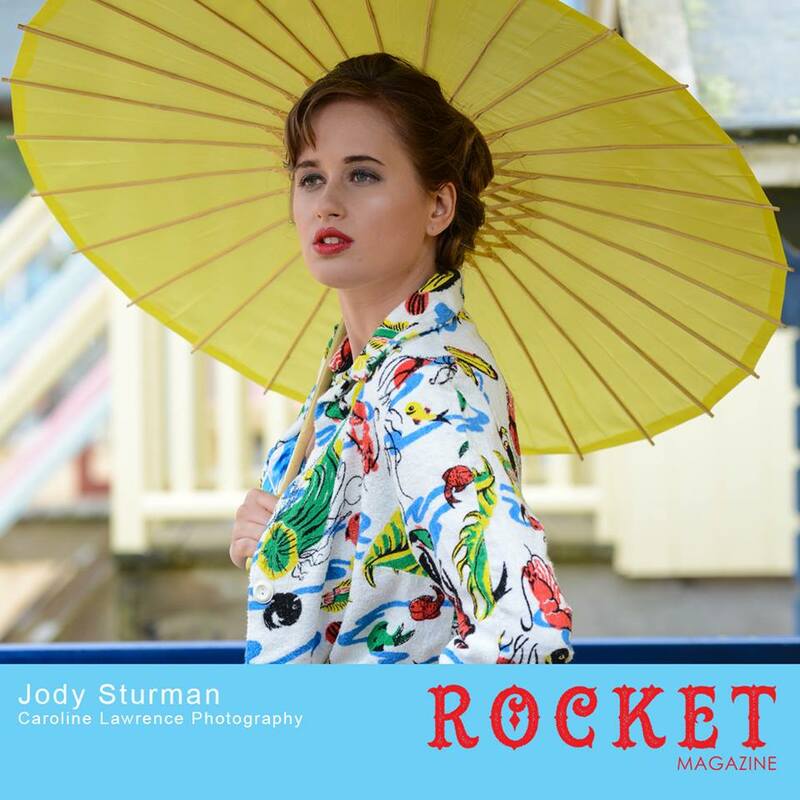 Something you would never realise from the images – Jody is such a trooper! Although happy with how it was going we were all lamenting the lack of sunshine when lo and behold, the sun actually got out and it became a different day altogether! Still with the red suit on, we headed towards the dunes and water for some different images, inadvertently disturbing a courting couple in the dunes but I think they were entertained by our antics! Caroline was then able to work her magic in the sunshine with the sea up close, a great opportunity to bring out the sunglasses for some typical ‘50s poses, and yes we got Jody running about in the water, capturing the joy of a sunny day at the seaside! 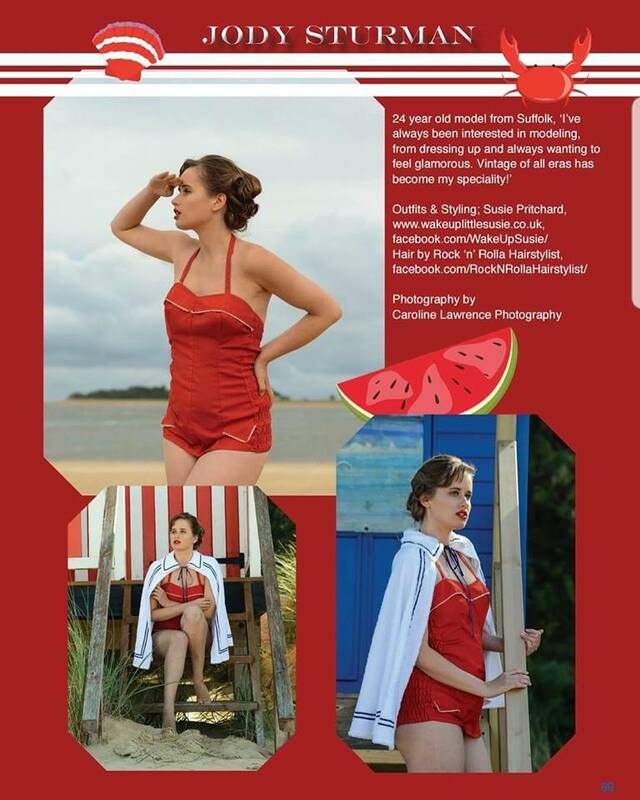 I’d also managed to source out a late ‘60s bathing suit, in colours typical of that period as a contrast to the ‘50s pin-up look so it was back to the beach huts for a quick change, and Jessica worked wonders in her ‘beach salon’ (i.e. just sitting on the sand!) to brush out Jody’s pin curls and, with a little back combing, create a completely different look. This Raquel Welch/Bridget Bardot look suits Jody really well, and is a credit to Jessica’s forward planning that she was able to credit a second unique hairstyle from the very different first style, without the aid of electricity or a salon full of products. I love the way this particular look fits in with the sand and skyline. Although perhaps we wished the sun had appeared a little sooner, and Caroline wished she’d brought lighting with her to work with the natural light, it was actually an incredible day – lots of fun and creativity, brilliant team work and problem solving, and a beautiful set of images that showcase the skills and vision of all four of us. 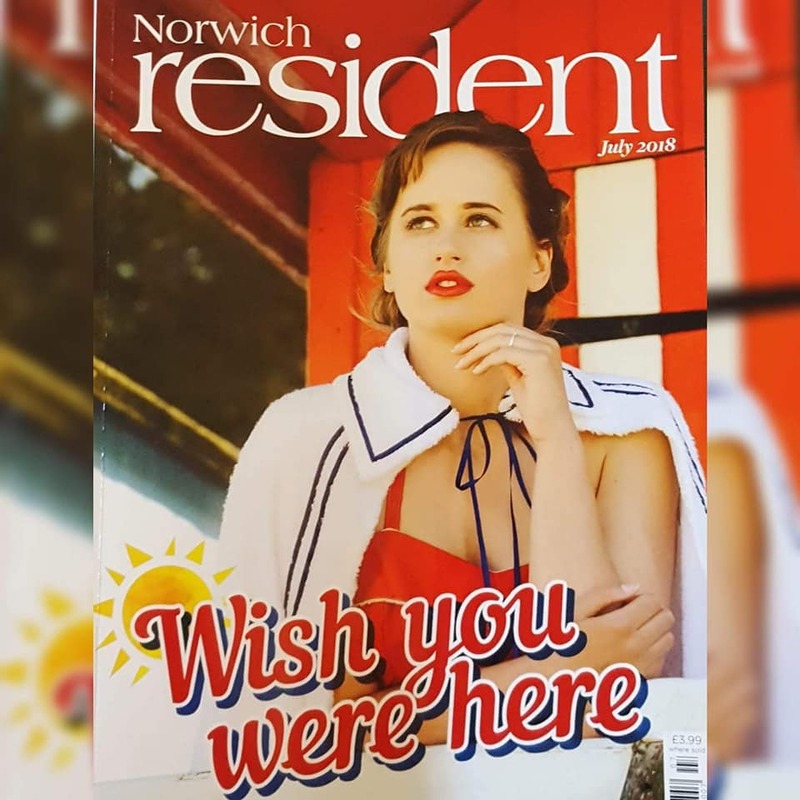 And we were so happy with the fabulous front cover and three page spread that our very good friends at The Norwich Resident gave us! Watch this space for the next Dream Team collaboration!